Poet Mary Szybist reads her “To the Dove within the Stone” as this On the Fly interview begins. She sat down for the interview when she visited Iowa City in March 2013 to read from Incarnadine. She discusses the influences—including Yeats’ “Leda and the Swan”—and goals for the collection, her preference for lengthy stretches of quiet time for writing, and the ways in which “being completely absorbed in the world” can help her recharge. Szybist is a graduate of the Iowa Writer’s Workshop and lived in Iowa City for nine years. Granted, her first collection, was a finalist for the National Book Critics Circle Award and won the 2004 Great Lakes Colleges Associations New Writers Award. 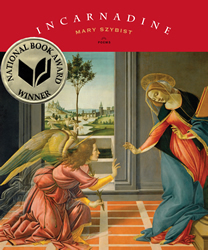 Incarnadine, her second collection, won the National Book Award for Poetry. Szybist has also won a Pushcart Prize, a Rona Jaffe Foundation Writers’ Award, and an Academy of American Poets Prize, among other honors.